– Chiefs over Bills: Arrowhead has become a tough home field advantage again. Kansas City is running better than any team in football. Buffalo can’t win in an atmosphere like this. – Dolphins over Bengals: Miami has to win a home game sooner or later (the Dolphins are undefeated on the road and winless at home). Cincinnati still is a soap opera. – Patriots over Vikings: My eliminator selection of the week. It doesn’t matter if it’s Brett Favre or Tarvaris Jackson. Either way, the Patriots are tough at home and the VIkings look really lost, especially defensively. – Packers over Jets: Upset alert. I still think the Packers have the tools to make a deep playoff run if they play to their capability. Call this one a hunch. Perhaps I also think the Jets are a tad overrated. – Jaguars over Cowboys: Major upset alert. Call this one a hunch too. David Garrard is back, while Jon Kitna starts for Dallas. I think Maurice Jones-Drew scores at least two touchdowns. Wade Phillips might get fired. – Titans over Chargers: Mini upset alert. Chris Johnson will have a big day. Philip Rivers will too, but Tennessee’s defense is among the best in the league. I think Jeff Fisher’s crew steals this one. – Broncos over 49ers: The NFL is sending its dud game of the week to London. Oops. Brian Dawkins’ return will help slow down Frank Gore, and I think the Broncos will want to show they aren’t as bad as the Raiders loss might indicate. – Raiders over Seahawks: I still don’t know what to make of Seattle, and after last week, the Raiders might actually have enough offense to win games like this at home. – Lions over Redskins: Upset alert (hey I’m under .500, I might as well take some chances). I think this will be shootout. I also think the Redskins were fortunate to win last week (they can thank Jay Cutler for throwing it to them). The Lions have the ability to score lots of points at home. I think they’ll get a few more than the Redskins. – Rams over Panthers: Steven Jackson says he’s healthy enough to play. That’s good enough for me. Besides, how can anyone back Carolina on the road? – Cardinals over Buccaneers: Two bad teams go at it. It’s in Arizona so I take the home team. Sometimes this isn’t an exact science. – Steelers over Saints: Something is clearly not right with the Saints. Pittsburgh may be the NFL’s best team top to bottom right now. Good luck Drew Brees, even at home. – Colts over Texans: Peyton Manning won’t let the Colts get swept by a division opponent. His programming doesn’t allow it. – The 59 points represent both the most points scored in Raiders history and the most points allowed in Broncos history. – The Broncos allowed a staggering 508 yards of total offense, including 328 on the ground. – Darren McFadden rushed for 165 yards and three touchdowns, which is bad enough. He averaged 10.3 yards a carry. Think about that. That means he was on average getting a first down every time he touched the ball. That’s just the tip of the iceberg. This thing was an avalanche coming down the mountain from the word go. A 43 yard touchdown pass to Zach Miller. A 30 yard interception return by Chris Johnson on Denver’s first play from scrimmage. A fumble by Demariyus Thomas on Denver’s second play from scrimmage. One thing led to another before anyone could blink the game was over before it began. Watching this game, it was easy to Denver’s confidence deflate. There was no emotion on the sideline from anyone, coach or player. What we ended up with was a rivalry game where one team didn’t hold up their end of the bargain. My biggest question is how does something like this even happen? NFL defenses don’t give up 59 points in three quarters of play, they just don’t. If this were a high school game a running clock would have been instituted. The Raiders pulled their starters after three quarters, otherwise I’m pretty sure they could have taken a good stab at the NFL record of 73 points (Chicago Bears – 1940 NFL Championship). This brings up a side question: WHY did the Broncos leave their starters in the entire game? This made zero sense considering risk of injury in a meaningless situation by the fourth quarter. Despite leaving starters in, the Broncos gave up an embarrassing amount of points to a team that’s not even good. The Raiders are under .500. They are not considered to be a contender in any way. This a game where if the Broncos had given the same effort they did last week against the Jets, they would have won, perhaps handily. This game reflects a big problem for the Denver Broncos. Since starting 6-0 last year, the Broncos are a pathetic 4-13. What we saw today was a lack of preparation, lack of intensity, lack of attention to detail, and pretty much a lack of anything. For the Broncos to come out at home against a division rival, in a game they had to have, and give that kind of embarrassing performance, it has to speak to larger problem at hand. I have been a defender of Josh McDaniels (one of the few), but even I can’t find any way to justify this. I’m not sure if the large problem at hand is a personnel issue, play calling issue, weekly preparation issue or something else. All I know is Broncos fans expect and deserve better than this. This performance was so bad that I would have shut the game off in the second quarter if I wasn’t getting paid to watch it. It would have marked the first time in my life I would have turned the Broncos off by choice. I have sat through blowouts and bad losses, some of them in person, and have never left the stadium early or shut off the television, no matter how bad it got. I remember sitting in the south stands at old Mile High Stadium with my dad in 1994, watching a similar contest that the Broncos lost to the Raiders 48-16. In that game the Broncos wore throwback uniforms from the mid-60s and played at a level matching the 60s Broncos. Today the Broncos managed the same feat without the 60s attire. Wade Phillips was the head coach that day in 1994. The fans threw things at him as he left the field after the game. He was fired at the end of the season, having lasted just two years. To my knowledge no one threw anything at Josh McDaniels today, but with the Broncos at 2-5, we might see another Broncos coach canned after two seasons if this doesn’t turn around. I’ve been behind him since he’s been here, but this is unacceptable. The honeymoon period is officially over Josh. You need to fix this. Now. I don’t care how, just fix it. Broncos fans deserve better than this. Well, last week we took some shots on upsets that didn’t pan out. As we get into this week, all of the talk is about the NFL’s new emphasis on violent hits. I’ll be curious to see who gets fined and suspended, but more than that I’ll be curious to see what effect this has on the game. A lot of players are going to have to change the way they’ve been taught to hit since high school to avoid getting fined. I also find it interesting that the league is so concerned about player safety, yet they are prepared to lock the players out in March, which would result in players losing their health benefits. Player safety is also of course a downside of the proposed 18-game season. It seems as though the league wants it both ways. Ultimately, I don’t think the game will change that much in the short term, but that could depend on the amount of fines and suspensions that are handed out in the next month. Now, on to the picks. – Ravens over Bills: This is the blowout of the week without question. Baltimore gave one away to the Patriots last week, so they will be highly motivated at home against a vastly inferior opponent. Ed Reed is also back in the lineup so that will be further bad news for opponents. This would be my eliminator pick except I’ve already used the Ravens. In any case Baltimore will win this one rather convincingly against the hapless Bills. – Dolphins over Steelers: Mini upset alert. Miami was very impressive last week against the Packers, so they are playing better than expected. The odd thing about the Dolphins is they are 0-2 at home and 3-0 on the road, so maybe playing this game in the shadow of South Beach isn’t the best thing for them. Still, I thought the Steelers looked less than impressive against the Browns for much of that game, and if they play like that this week they could be in trouble against Miami’s defense. I also think Brandon Marshall could be in line for some big plays in this one, particularly because the Steelers’ defense might be more timid than usual due to the prospect of fines or suspensions from the league. – Patriots over Chargers: I know this game is in San Diego, but the Chargers just don’t look right or feel right. Besides the fact that they keep losing games to those they should be destroying (granted all of those have been on the road), they are actually piling up terrific stats in the passing game, are outgaining almost all of their opponents, yet are not scoring points. I for the life of me can’t understand why Darren Sproles isn’t more involved in what they’re doing. He is the type of player that can score any time he touches the ball, yet they refuse to give it to him. Makes sense to me! Must be part of the Norv Turner philosophy of not winning. In any case, the Patriots absolutely own the Chargers, and that’s not likely to change given the Patriots are off to a fast start and the Chargers are still at the starting line. Something tells me this will be close until Tom Brady leads a drive at the end for the win. – Falcons over Bengals: I have to wonder if the entire Cincinnati Bengals organization has completely jumped the shark. In the two weeks since their embarrassing home loss to Tampa Bay I have seen multiple advertisements for the T.Ocho Show on Versus. I’m sure that’s exactly what Marvin Lewis wants to see: his two star diva receivers hosting their own show instead of concentrating on stopping the team’s current losing skid. What could more of an issue in this game though is the secondary, which will have to contend with Roddy White and the rest of the weapons at Matt Ryan’s disposal. The Falcons have been extremely tough at home, and I think the combination of their offensive attack along with an ability to put pressure on Carson Palmer all day gives them the nod. In fact this may not be close. – Saints over Browns: Cleveland is resorting to Colt McCoy for the second straight week, which is obviously bad news. That said, the Browns hung in longer than expected last week in Pittsburgh, and a hunch says they might be able to keep this one closer than expected if they can run the ball effectively. I realize this game is at the Superdome, and while I’m not picking the upset, I do think this could be a competitive game. In the end I think Brees and company will be too much especially on their own field, but something tells me that with Pittsburgh looming next week the Saints might be caught looking ahead. That might be enough to make this interesting in the fourth quarter. – Chiefs over Jaguars: David Garrard is out for the Jags. Trent Edwards might be out as well. That means Todd Bouman could well be the starter at Arrowhead. Ouch. Given that the Chiefs are hungry after two difficult road losses, this could get ugly and fast. This might be a good week to start the Chiefs’ defense in fantasy because they might score a touchdown if Jacksonville’s offensive performance last week is any indication. I’m thinking this could be 40-10. That’s why I’m making the Chiefs my eliminator selection this week. – Eagles over Titans: I really went back and forth on this game. The Titans looked very impressive last week especially on defense, while the Eagles also gave a tremendous performance against a good Falcons team. Both teams have frankly looked great at times and lost at others this season, so it will be interesting to see what unfolds. Both teams have quarterback issues due to injury. Kevin Kolb will start again for Philly, although there are rumblings Michael Vick might be available in a limited capacity. Tennessee as of this writing is unsure whether it will be Vince Young or Kerry Collins. Philadelphia also won’t have big play threat DeSean Jackson available. Still, a hunch says that while this will be a thrilling game, I think the Eagles will make one more play and will pull out a close road game heading into the bye week. 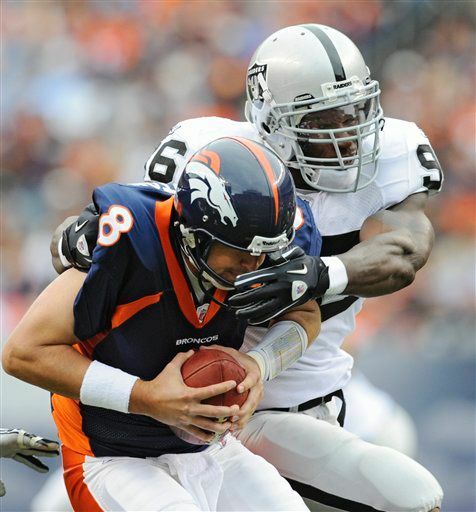 – Broncos over Raiders: For several years now, this rivalry has been not been what it used to be. This used to be one of the more intense and fierce rivalries, and now it’s gotten to the point where both teams have struggled, and it’s hard to feel much excitement about this matchup. In each of the past two seasons, the away team has won each game, perhaps another oddity of this series. Last year was particularly painful for the Broncos because they allowed JaMarcus Russell to beat them, and there is no other word besides embarrassing that applies to that. This year the Broncos could be in a similar situation because there is a good chance Jason Campbell will not be able to go, and that means Kyle Boller could well get the nod at QB for the Raiders. Denver has lost two in a row but they have also played a rigorous schedule. Now that it’s getting friendly, the Broncos need to take advantage. They should be able to get it done on Sunday at Mile High. – Redskins over Bears: This game actually has a very interesting subplot for us Denver folks. Mike Shanahan, the coach who led the Broncos to their two Super Bowl wins, going against the quarterback he drafted, Jay Cutler. It is of course unknown where the Broncos would be today if Shanahan was still coaching and Cutler was still under center, but I think it could be interesting to see them go against each other. 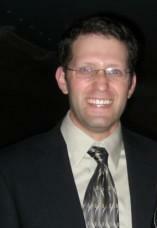 If Shanahan is smart, he will send numerous pass rushers Cutler’s way because the Bears offensive line has been awful. Cutler isn’t getting the chance to throw his usual interceptions because he is getting sacked so often. If the Redskins can continue to run the ball with effectiveness, I think they stand to win this game even on the road. The Bears may be 4-2, but their record doesn’t reflect how mediocre they are. Washington wins. – 49ers over Panthers: Call this one a hunch. San Francisco is embarking on a long road swing, because they get the London trip following this game. Carolina is switching quarterbacks again, going back to Matt Moore after Jimmy Clausen has been largely ineffective. The Panthers should have a good running game with DeAngelo Williams and Jonathan Stewart, but both have been big disappointments so far this year. I think now that the 49ers have a win under their belt, they should start playing with a lot more confidence. I say it every week, but San Francisco has more than enough talent to get back in the race. The key is Alex Smith. As long as he duplicates what he did in the second half last week, the Niners will be fine in this game. – Rams over Buccaneers: Both teams have to rank as surprises, as each has three victories under their belt. Still, this does not rank as one of the week’s better offerings, and a blackout in Tampa for a non-sellout is a certainty. I think the Rams actually have the look of a team that could pull off a few more surprises, for Sam Bradford is playing extremely well, and he has a good running game to lean on led by Steven Jackson. Tampa Bay is quietly playing good defense at times, but they haven’t been able to do it against the league’s elite. Since St. Louis isn’t in that category yet, I think this should actually be a very competitive game, but I think the Rams have a little more offense and will be able to steal this one on the road. – Cardinals over Seahawks: The challenge for the Cardinals will be keeping up their surprising play from their win over the Saints two weeks ago. Since then they have had the bye, but perhaps we might see a resursange of offense from Arizona if Max Hall can continue to play well enough to keep the starting job. If he can play decently, he has more than enough weapons at his disposal that the Cardinals should be able to pile up yards in the passing game. Seattle is a tough team to figure because they have won some big games and they have also lost some clunkers. I think this should be an entertaining game but I think if we see the return of offense from the Cardinals that I expect, than they’ll have more than enough to win even on the road. – Vikings over Packers: Did you know that Brett Favre used to play for the Packers? Apparently that makes this game kind of a big deal. This is a big game for both teams because neither has played up to expectations so far this season. Green Bay in particular has disappointed big time in recent weeks, partially because they’ve battled injuries. Minnesota appeared to get back on track last week against the Cowboys, and with a win at Lambeau they can get right back into the discussion in the division race. While Favre and Randy Moss are still getting their timing down, both will be highly motivated to play well against the Packers on a national stage. I think Aaron Rodgers will lead the Packers to some points, but I see the Vikings getting just a few more. This should be a great game despite all the Favre hype. – Cowboys over Giants: In spite of statements to the contrary from Jerry Jones, the Wade Phillips watch is clearly on in Dallas. Let’s just say that 1-4 starts don’t sit well in the minds of Cowboys fans or in the mind of their high profile owner. Tony Romo and company actually played well last week, but they ran into an equally desperate Vikings team on the road. I think the Monday night home crowd should energize this team, and the key will be how the defense handles the Giants’ running game. Ahmad Bradshaw and Brandon Jacobs are both running well, so this could be a tough task for the Cowboys. In the end I think Tony Romo will have a huge night and that will be enough to help the Cowboys outscore their division rivals. – My plea to the Broncos: Go back to the orange jerseys full time. Please. Orange will always be the true identity of the Broncos. I never did like the blue jerseys. Trust me, most Broncos fans want this. – The pass interference call was legit in the sense that Renaldo Hill did grab the face mask. However, Santonio Holmes was pushing off as much as or more than Hill. The bottom line is you rarely see that penalty called on a desperation heave like that. Yes a penalty should have been called, but in my opinion the correct call would have been a face mask, which is a 15-yard penalty, instead of the pass interference spot foul. – Congratulations to Tim Tebow on his first touchdown. More on this below. – I completely agree with Denver Post columnist Mark Kiszla, who says this year’s 2-4 Broncos team is better than the one that started last year 6-0. Look, I know Broncos fans are still frustrated with Josh McDaniels. I know people don’t like some of his personnel moves. I personally believe that Kyle Orton is a better quarterback than Jay Cutler. He makes better decisions, he’s more accurate, and he doesn’t throw dumb interceptions in the red zone. I also think that Brandon Marshall’s production has been more than replaced by Brandon Lloyd, Jabar Gaffney and an improved season from Eddie Royal. Look, I know the Broncos’ record isn’t great, but their schedule has been incredibly difficult, and it’s not as if Mike Shanahan is tearing it up in the nation’s capital. People keep pointing to his “success” but he’s 3-3, including a blowout loss to the Rams. Let’s not anoint him king of the NFC East just yet. I actually thought the Broncos played a very good football game against the Jets, it just so happened that Rex Ryan’s crew was a little bit better. The Jets are proving that they are a legitimate Super Bowl contender. They play tough defense, and they have somehow found the fountain of youth or a sorcerer’s stone for LaDainian Tomlinson, who looks like the LT of five years ago. On Sunday, the Broncos defense did step up to the plate, forcing three turnovers. However, the offense were victimized by some uncharacteristic mistakes. A horrible snap by Lonnie Paxton cost them a field goal. Another bad snap by J.D. Walton ended their final drive. Knowshon Moreno fumbled in the first quarter when the Broncos had momentum going their way. On the positive, the running game resurfaced, thanks in large part to hard running by Moreno, who finally looks healthy again after battling hamstring injuries. Kyle Orton continues to play well. Tim Tebow even got in the game and contributed, scoring his first touchdown (no doubt selling another 2,000 jerseys with that run). I don’t mind the idea of Tebow as a change of pace, so long as he’s not keeping Orton off the field for extended stretches. When Tebow was in the game, Orton stayed in as well, splitting out as a receiver. On every single play Tebow was in, he kept it either on a draw or an option. I would like to see the Broncos have Tebow throw a pass at least once, just to keep the defense off balance so they’re not expecting a keeper every time he’s in there. He also at some point needs to involve Orton on the play, either by throwing to him or having Orton come back around and take a pitch, something again to keep the defense off balance. Perhaps these things could be in play down the road. I know 2-4 is not what the Broncos had in mind, but I think they are moving in the right direction. The schedule does get a lot friendlier coming up. The Broncos host the Raiders next week and then play the 49ers in London before the bye. Certainly these should be two winnable games for Denver. In the second half the Broncos do have five division games plus dates with the Rams and Cardinals. Kansas City is not exactly invincible at 3-2 in the AFC West lead, so the Broncos are still more than capable of getting into the division race. If the return of the running game and aggressive defense are not flukes the Broncos will be fine. – Packers over Dolphins: I am stunned to see that six of the eight ESPN experts are picking the visiting Dolphins. Really folks? What are you smoking? This game is at Lambeau Field. Plus, the last time we saw the Dolphins, they got completely run off their own field by the Patriots. Miami looked so lost and confused that game that they aren’t beating anyone unless they get major improvement in a hurry, especially on defense and special teams. I know the Packers lost last week, but this team has way too much talent to lose a home game like this. Aaron Rodgers has even been medically cleared to play so that is not an issue. He will be out there, and that means he’s putting up his usual big numbers. The Packers are Super Bowl contender and the Dolphins are not. Did I mention the game is at Lambeau? Case closed. – Ravens over Patriots: I picked Baltimore to win the Super Bowl before the season started, and so far I have seen no reason to lack confidence in the selection. The defense is its usual brick wall self, plus they are scheduled to get Ed Reed back in week seven. The Ravens also have the offensive weapons to put 30 points on the board, as they did last week. If the Ravens don’t turn it over, they might just be unbeatable. The Patriots have played very well certainly, but I think they’re going to miss Randy Moss more than they realize. Deion Branch should feel comfortable returning where he had success, and while I think the Patriots are still the best team in the AFC East, I don’t see them stacking up to the Ravens even at home. Let’s not forget Baltimore torched them in Foxboro during the playoffs last year. This will be closer, but the Ravens will still win. – Broncos over Jets: UPSET ALERT. All things being equal, the Jets are the better team. Their defense has been outstanding (first in the league against the run), and their offense has done enough to win games. LaDainian Tomlinson has somehow found the fountain the youth, and that is making things easier for Mark Sanchez. I know this doesn’t look good for the Broncos with their complete lack of a running game (although Knowshon Moreno should be back finally), plus their assorted injuries on defense, but this smells like a big trap for the Jets. New York has the bye following this, and they are coming off a short week with the Monday night win. This is a long trip west plus they are going to altitude. I think these factors coupled with possibly overlooking the Broncos could prove to be trouble for the Jets. I think Kyle Orton has another huge day, especially if Darrelle Revis sits out as expected. I think the home crowd gives Denver a lift and they find a way to pull the upset. – Steelers over Browns: Ben Roethlisberger is back. Colt McCoy is starting for the Browns. The Steelers own this series. Let’s just move on to a more competitive game. The only reason this isn’t my eliminator pick is I’m saving the Steeelers for later in the season. – Texans over Chiefs: This one is very interesting. I am starting to think the Chiefs’ defense might be for real given the way they shut down Peyton Manning last week and held the Colts to a bunch of field goals. The thing that gives me major pause though is Matt Cassel, who is continuing to prove he is nothing but mediocre. At least the Chiefs are starting to give Jamaal Charles more carries, which is a really good idea given his explosiveness. The Texans got mutilated in every way last week, but I would be shocked if their offense laid that big an egg two weeks in a row. Plus, their defense should continue to get better as Brian Cushing gets settled back in. This will be close and should be highly entertaining, but I’m taking the Texans at home on a hunch. – 49ers over Raiders: I feel like Charlie Brown kicking the football when it comes to the 49ers. I picked them to win the division at the start of the season. I keep picking them to win every week. Every week they hang another loss on my record in maddening fashion. I guess I figure they can’t possibly go 0-16. The talent is still there. They have the ability to run, to pass, and their defense should be among the best in the league. Part of me still says that if they can turn it around, they aren’t out of it because the NFC West is so atrocious. I think they’ll get it done here because the Raiders have a proven track record of not coming to play two weeks in a row. Last week they stunned the Chargers, but I don’t think they have it in them to care in back to back weeks. If the 49ers lose this I’ll be the last one off the bandwagon. – Chargers over Rams: San Diego is 2-3, which actually isn’t all that different from where they were a year ago. The Chargers have the look of a team that just hasn’t turned the switch on yet. Their two wins have been blowouts, and their three losses have been major head scratchers against teams they should have beaten. I think the Rams could actually give them a challenge at home, especially given the way Sam Bradford is playing in his rookie season, but I also think they don’t have what it takes to stop all of San Diego’s weapons. I am perplexed as to why they don’t use Darren Sproles more. Perhaps this is the week they unleash him on the speedy indoor surface in St. Louis. – Vikings over Cowboys: Call this the disappointment bowl. Both teams were expected to be major playoff contenders. Now, both sit 1-3 and in danger of completely falling off the map. In some ways, this could be considered an early playoff game, because the winner can start to see the middle of the pack again, and the loser will pretty much be TKO’d. I am highly amused by the way that Jerry Jones says he is not planning on firing Wade Phillips “at this time”. That has all the makings of him feeling differently in a month. I think both of these teams have talent that does not reflect their poor record, but something has to give here. I think given that the game is in Minnesota, I am sensing a big breakout game for Adrian Peterson as well as the passing game. I also don’t like this matchup for the Cowboys offense (remember the playoff beatdown last year?). I think the Vikings still could be a playoff team if they can stay healthy, and it just doesn’t appear to be in the cards for the flawed Cowboys. – Giants over Lions: This is my eliminator selection for the week. I know the Lions routed the Rams last week, but they still have yet to take their act on the road in a number of years. I don’t like their chances here with Shaun Hill still taking snaps for the injured Matthew Stafford. I think the Giants for the past two weeks have been more than solid in every phase of the game. The defense is getting tremendous pressure without having to use exotic blitz packages, and that is making them extremely effective against both the run and the pass. I also think the running game is humming along nicely, especially now that Ahmad Bradshaw’s heel should be healed heading into this game. I think the Giants offense could put up 30 points for the second straight week, and that should be more than enough. – Falcons over Eagles: Michael Vick still looks to be out for the Eagles, although Kevin Kolb did play pretty well in the win over San Francisco. Still, the Eagles appear to be one of those teams that looks extremely flashy but can’t seem to put things together on a consistent basis. I think the Falcons are on the verge of really breaking out, to the point where they could be considered one of the league’s top five teams. Their passing game in particular has been lighting it up, and I don’t see that changing against anyone. Their defense has also been playing exceptionally well. I take the Falcons on the road. – Bears over Seahawks: Jay Cutler returns after sitting out last week with a concussion. The Bears were able to win without him thanks to another outstanding defensive effort, plus, well, they were playing a Panthers team that wasn’t much opposition. Still, the Bears have to rank as one of the early surprises of the season at 4-1, and they have another very winnable game Sunday at Soldier Field. Seattle has been very up and down, but the one constant is they’ve been awful on the road. If the Bears defense continues to play as well as it has, I think they’ll cause major problems for Matt Hasselbeck. I’m still not sold on Chicago’s offense, but they won’t need to score very many points to win this game. – Saints over Buccaneers: New Orleans losing to Arizona last week was one of many major upsets. The Saints are starting to see what every defending Super Bowl winner sees: the absolute best effort from every opponent. That should still be true against Tampa, where the Buccaneers are somehow over .500. Last week they were able to take advantage of major errors by the Bengals, but I think the Saints have too much pride not to come out fighting after last week’s loss. Plus, the last time I picked the Bucs to win they got shredded 38-6 at home. Thus, I pick the visiting Saints. – Colts over Redskins: Mike Shanahan has quietly put together back to back wins against quality opposition, and the Redskins are 3-2 and in the mix. This game will tell us a lot about the progress Shanahan has made in D.C., because the Colts are the one team that always shredded his Denver teams no matter what. The Redskins’ defense has been terrific the last two games, but of course they are about to tangle with Peyton Manning. The Colts haven’t quite looked themselves this season, but I’m still not one to bet against Manning without a compelling reason. I think he bounces back with a monster game on Sunday night, and I just don’t think Donovan McNabb and company can keep up. – Jaguars over Titans: This is an upset alert of sorts, but I only say that because all eight ESPN experts are going with the Titans. I don’t think a Jacksonville win can be considered much of an upset when they are at home on a Monday night and they are coming off back to back wins. The Jags’ offense has scored a combined 67 points in their last two games, and David Garrard has shockingly thrown multiple TD passes each week. The Jaguars also have Maurice Jones-Drew, who has owned the Titans in previous meetings (think multiple 80-yard touchdown runs last season). Chris Johnson is of course a threat to score every time as well, but I think Vince Young might actually have a tough time with Jacksonville’s defense. I pick the Jaguars, and I don’t think it’s much of a stretch. Honestly I really could just cut and paste my post from last week about the running game. The only difference this time is, the Broncos did not win the game. Last week the Broncos beat Tennessee despite rushing for just 19 yards. On Sunday, the Broncos actually doubled their rushing output, posting 39 yards on 13 carries as a club. In the second half, the Broncos called just three running plays totaling just one yard. By contrast, the Ravens carved up 233 yards on the ground on 47 carries, an average of five yards per carry. From those numbers even a football novice should be to tell who won the game. Sure, Kyle Orton threw two more touchdown passes and continued to pad his stats with another 300 yard passing effort, but it has been long proven that passing numbers don’t tell the whole story. I am definitely on the Orton bandwagon and he is rapidly becoming a shoo-in for the Pro Bowl, but he can’t do it all by himself. The Ravens game proved that the Broncos can’t win every week being a one dimensional team. At some point they are going to have to establish some kind of running game in order to sustain success. If they don’t, defenses know they don’t have to respect the running game. The Broncos rank dead last through five games with just 259 yards rushing as a team (this even ranks behind eight teams who have had a bye and have played one fewer game), and they are averaging just 2.3 yards per carry. Every other NFL team is averaging at least 3.0 yards per carry. Even the winless 49ers are averaging 3.7 yards per carry. Needless to say, the Broncos are threatening to be the worst team running the football in NFL history. What’s worse than the numbers is the fact that the Broncos offensive line got completely dominated along the line of scrimmage against the Ravens. We know that Baltimore has long been one of the more physical teams in the NFL and they wear down a lot of teams. That said, the way the Broncos got physically manhandled Sunday was alarming in more ways than one. I realize they are battling injuries along the line and they are starting several rookies, but Josh McDaniels has talked about building a physical team ever since he got here, and on Sunday the Broncos were anything but physical. I have been perfectly willing to give McDaniels the benefit of the doubt, but he’s going to have to start getting results soon to avoid the wrath of Broncos fans who are watching Mike Shanahan get surprising wins with the Redskins and are getting ever the more ancy about McDaniels’ personnel decisions. McDaniels does seem to know football and many of his decisions have worked out, especially in the passing game. It remains to be seen however if he can truly build a successful franchise over the long term. The Broncos schedule is still very rocky coming up. Next week they host the Jets, who have not lost since week one. The good news is standout cornerback Darrelle Revis may not play due to injury. The bad news is five Broncos defenders, including Brian Dawkins, have been declared out. The Jets defense did a very nice job last night against Adrian Peterson, so I shudder to think what they will do against the Broncos’ running game. The good news is the AFC West is still there for the taking, with the Chiefs leading the way at 3-1 and everyone else coming in at 2-3. If the Broncos can figure out the running game, the passing attack is more than good enough to put points on the board. Knowshon Moreno is getting much closer to returning and could be activated on Sunday so that will help, but the much bigger issue is the offensive line. Here’s hoping that next Tuesday I’m not writing about the running game for the third week in a row. – Jaguars over Bills: Jacksonville picked up a monster win last week against the Colts, one of its biggest wins in team history. For all the talk of David Garrard not being the answer at quarterback, he keeps managing to make plays with his feet and has been very adept at making throws in the red zone. Maurice Jones-Drew broke out with two touchdowns last week, and I think he has a very favorable matchup for another big day against the Bills. Buffalo’s defense has not come close to stopping anybody, so it will be interesting to see if the Jaguars can keep up their surprising offensive play from last week. The Bills are very much a mess and while they do have the home field, it hasn’t helped them much so far. I like the Jags to keep up the momentum from last week’s big win. 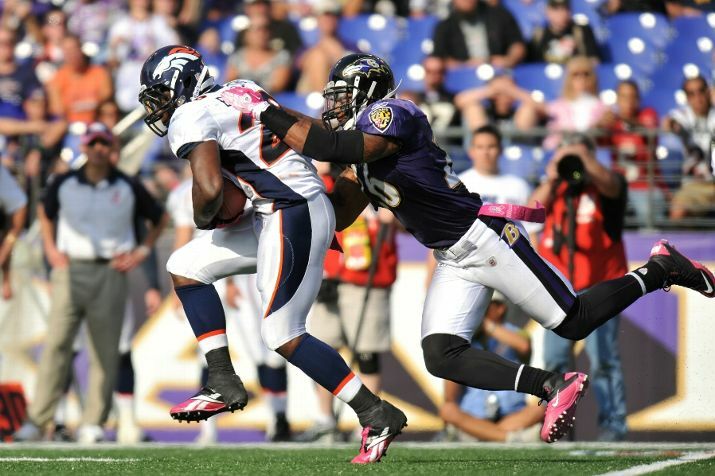 – Ravens over Broncos: The Broncos have traditionally not played well in Baltimore. In fact, they’ve never won there in the Ravens’ existence. To boot, the Broncos have averaged just nine points in their four trips to Maryland. The Ravens gave an impressive performance in their comeback win against the Steelers last week, and their defense is playing as well as it ever has. What will be fun to watch is Denver’s top ranked pass offense against Baltimore’s top ranked pass defense. The Broncos’ inability to run the ball is what will doom them in this game, because it’s unrealistic to expect that Kyle Orton will be able to pass for 350 yards against a defense as good as the Ravens. This could be closer than previous meetings, but I still like Baltimore to win at home. – Bengals over Buccaneers: Cincinnati is a somewhat perplexing team. They have talent all over the place on both sides of the ball, but have yet to really put something together consistently at every position for an entire game. Still, Terrell Owens showed last week he can still play, and he and Ochocinco will be a very potent combo by year’s end. The defense is still the strength of the team, and that will be enough at home against a Buccaneers team that pulled two wins out of nowhere but is rapidly falling to Earth. This might not be close. – Falcons over Browns: Roddy White may well have saved Atlanta’s season with his hustle in the final minute last week, chasing down Nate Clements and allowing the Falcons to retain possession and set up the winning field goal. I think the Falcons are very much a playoff team, and if they are going to show it they need to be able to win games like this on the road against teams they should beat. Cleveland got a nice win last week, and they running the ball with surprising effectiveness, so they should be able to make it a competitive game. I think Atlanta simply has more playmakers and that should be the difference, but this should be interesting. – Texans over Giants: Both teams are coming off wins, and in the Giants’ case their defense was dominant. They will have a much harder test stopping the high octane Texans’ offense, especially with Andre Johnson coming back. The Houston defense also gets a tremendous shot in the arm with the return of linebacker Brian Cushing, who returns from a four game suspension. The Texans currently reside in the first place in the AFC South, which is certainly unfamiliar territory with the Colts’ dominance, but to stay there they need to defend their home field. I think they will do it thanks to some big plays on offense. The Giants should be able to get some running success with Ahmad Bradshaw, but I just don’t think they’ll be able to keep up. – Colts over Chiefs: It is very hard to process the fact that the Chiefs are the lone unbeaten team remaining in the league. Their defense and special teams play has been terrific, but I still have long term doubts about the offense as long as it is led by Matt Cassel. I also think they are crazy not to make Jamaal Charles the feature back when he is so much better in virtually every way than Thomas Jones. The Colts on the other hand are coming off a rare loss, and generally they will not lose two in a row even if they were playing an all-star team. I think Peyton Manning will have a monster day and the Chiefs will get a slap of reality. This is my eliminator selection for this week. – Cowboys over Titans: The Cowboys have had the bye week to figure things out, and I sense a big winning streak coming. The defense was outstanding in their last game before the bye, and I think the offense has too many playmakers not to break out eventually. Chris Johnson has been completely shut down in two of the Titans’ four games this season, and it’s no coincidence those are the two games they didn’t win. The Titans need Johnson to be effective, and this will be another tough matchup for the highly touted running back. I think the Cowboys defense will be able to contain him and the offense will score more than enough to win. – Chargers over Raiders: I think it’s more than likely we’ll have blackout number three in the Bay Area. The Raiders drew just 32,000 fans for their last home game, and there is no reason to think they’ll get any more coming off a loss. San Diego has played extremely well at home and has been awful on the road, so this will be an opportunity for them to make a road statement. The Raiders are always a tough team to figure out because you never know when they are going to play with effort and when they’re going to mail it in. I think they might show up for this one, and the running of Darren McFadden will keep them in it, but there is no way San Diego should lose this game if they play as they should. – Packers over Redskins: This should be a highly entertaining game. The Redskins are still trying to find an identity, especially with Clinton Portis being shelved for 4-6 weeks due to injury. Ryan Torain ran hard in last week’s win over the Eagles, but the Packers have one of the best run defenses in football so this will definitely be a bigger challenge. The Packers’ are a threat to score 30 points every week thanks to the potent passing game, so it will be up to the Redskins to keep up. Santana Moss got shut out last week, and that certainly won’t happen again, but even so I just don’t see Donovan McNabb keeping up with Aaron Rodgers. – Panthers over Bears: Jay Cutler is out with a concussion, but it doesn’t matter who is back there as awful as their offensive line was last week, allowing a staggering 10 first half sacks. Given that the Bears offense is guaranteed to struggle with Todd Collins under center, it will be up to the defense to win a low scoring game. I think the Panthers will control the clock with DeAngelo Williams and Jonathan Stewart, and they aren’t going to ask Jimmy Clausen to do much in this game. This game might well end up 6-3 and you have my sympathies if you’re stuck with it. I pick the Panthers in what amounts to a coin flip since they are the home team. – Lions over Rams: St. Louis has won two in a row and finds themselves in first place in what is easily the NFL’s worst division. While the Rams have proven they can play at home, we all know the road is a different deal, even if the road destination is the Motor City. I thought the Lions showed incredibly well at Lambeau Field last week, and I think the home field may be enough to turn things in their favor against a team they certainly should be able to compete with. Jahvid Best is making many other teams wish that they drafted him in April. I think Detroit gets the home win, in a game that could quietly be one of the more entertaining offerings of the week. – Saints over Cardinals: The Saints slaughtered Arizona last year in the playoffs, and that when the Cardinals still had Anquan Boldin and Kurt Warner. Now, the Saints get an Arizona team that benched a woeful Derek Anderson this week and will start rookie Max Hall at quarterback. It remains to be seen if the QB switch will actually help the Cardinals, but the Saints continue to show that they can score lots of points, and even though they are on the road, I think they will have enough to win this game. The Cardinals are clearly not the same team they were last year, and the experienced Saints have more than enough to exploit that. – 49ers over Eagles: San Francisco has to be heartbroken by the way they lost week against Atlanta. If Nate Clements simply ran out of bounds after his interception, the game would have been over. Instead, he fumbled and the Falcons drove for the winning field goal. The funny thing is they are still very in the division race even though they are 0-4 because the NFC West is so awful. The Niners actually played very well in their last home night game, and I think the crowd will give them a lift. The Eagles won’t have Michael Vick, who is out with a rib injury, and I just don’t think Kevin Kolb gives them the same oomph offensively. I like San Francisco in the mini-upset. – Vikings over Jets: For once it seems like the Monday night game is actually a good choice. Randy Moss makes his Vikings debut and he will do so going against Darrelle Revis. Three weeks ago, Moss made a spectacular one handed TD grab for the Patriots with Revis guarding him. I think the Vikings will be fresh and motivated coming off the bye, and the Moss acquisition gives them some excitement as well. The Jets have played well in each of their last three games, and I do think they will play well again at home with the Monday night home crowd, but the Vikings know they are already chasing the Packers. I think Favre and Moss will mesh together immediately and it will open up Adrian Peterson and the running game. I also sense a couple of turnovers for the Vikings’ defense. Where Is the Running Game? I know the Broncos won in Tennessee, and it was a very nice win at that. Anytime you pull out a victory on the road, you are doing something right. 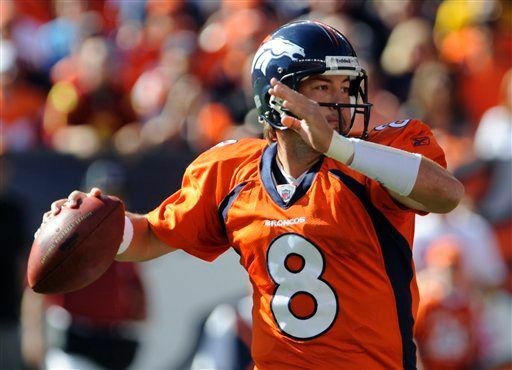 Kyle Orton has performed amazingly well (so well that his 1,485 yards passing is the second most through four games in the NFL modern era, trailing only Kurt Warner). I’m not going to say I told you so about Orton and the Pro Bowl. The special teams came up with a huge turnover late, and the defense did a phenomenal job shutting down Chris Johnson. The Broncos even got a couple of red zone touchdowns (although they still settled for too many field goals and misfired another time on downs). At 2-2, they are certainly in the pack in the AFC West. It is amazing really that the Broncos won on a day when they provided one of the worst rushing outputs in franchise history. The Broncos as a team rushed for just 19 yards on 20 carries. For those of you who are math challenged, that’s an average of less than one yard per carry. What’s worse is that 11 of those 19 yards came courtesy of Orton, which means they came on scrambles and not on designed runs. Taking out Orton’s rushing totals, Correll Buckhalter and Laurence Maroney combined for 8 rushing yards on 16 carries. Needless to say, the running game simply did not work. The Titans are an outstanding rushing defense, but even against a great team you obviously need your running backs to rush for more than eight yards. Through four games, the Broncos have yet to have any rusher collect more than 60 yards rushing in a game, and as a team the Broncos are averaging just two yards a carry through the first four games. No other team is averaging less than three yards a carry. The Broncos also rank dead last with 220 rushing yards through four games. The fact that the Broncos rank first in the league in passing offense through four games has so far compensated for their lack of running game. (That point makes me feel rather strongly that Kyle Orton is in fact a better quarterback than the one he was traded for, Jay Cutler, but that’s another discussion). The Broncos in fact did not call for a single rushing attempt in the final ten minutes of the game against Tennessee. Eventually, this will stop working if teams don’t feel need to worry about the Broncos running the football. Even the great passing teams of NFL history have had some small semblance of a running game to keep the defense off balance. I have no doubts that Orton will continue to pass the ball well and spread it around to different receivers, but if the Broncos don’t start running the ball, it won’t matter how well they are passing it, especially in short yardage and goal line situations. 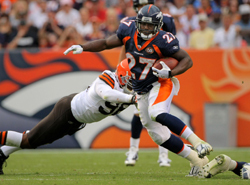 It should help that Knowshon Moreno will return to the lineup soon after missing time with a hamstring injury. He might even be ready to return Sunday in Baltimore. While his presence will help, it is clear that the offensive line still needs a lot of work. The Broncos made a real point of addressing the line in the draft, but it is clear that the rookies still are trying to get acquainted with playing at NFL speed and learning the game. All-Pro left tackle Ryan Clady is still recovering from his offseason knee injury, and Ryan Harris has missed time at the other tackle spot, although he did return to the lineup against Tennessee. The bottom line is the Broncos will need the line to play with a lot more consistency if they are to figure out how to run the football. The Broncos rigorous stretch of their schedule continues the next two weeks with dates at Baltimore and at home against the Jets. After that, it does get a little friendlier, although the London trip will be brutal, even if that game is against the highly disappointing 49ers. I think given the way the AFC West has unfolded so far, it is not unreasonable to think the Broncos can find themselves in the division race in December. Kansas City is certainly not going to stay undefeated, and the Chargers have been up and down through their first four games. If the Broncos can figure out how to run the ball, they can be in the race. If they don’t, their season will end up looking a lot like last year or worse. – Jets over Bills: This should be a blowout win for the visiting Jets, but something tells me this might be a close game. The Bills somehow managed to drop 30 points on the Patriots on the road last week, and although it remains to be seen if they can do it again, the home field advantage should at least help them stay competitive. The Jets have picked up two big division wins, so a letdown is possible. Darrelle Revis is also going to sit another game with a nagging hamstring injury. Despite all that, I think the Jets will win, but it may not be pretty. Say what you will about Rex Ryan, but the guy manages to win games. – Steelers over Ravens: I can already see what my biggest error was in preseason predictions. I picked the Steelers to miss the playoffs. Now, after a 3-0 start without Ben Roethlisberger, that doesn’t seem possible. Pittsburgh’s offense broke out last week (albeit against a bad team), and the defense has been easily the league’s best through the first three games. If the Steelers’ defense keeps shutting down teams as they have, they’re not going to lose many more games. The Ravens were my preseason Super Bowl winner and I think they can still get there, but they scraped by last week against a Browns team they should have destroyed. This should be a fantastic game, and a win by the visitors wouldn’t surprise me, but I have picked the Steelers to lose their first three games and was wrong each time. For that reason I have to go with Pittsburgh. – Browns over Bengals: UPSET ALERT. This just seems like too much of a trap for Cincinnati. The Bengals defense has been outstanding yes, but their offense hasn’t exactly been fulfilling its complete potential. The Browns, despite their 0-3 record, have been competitive in each game. They are running the ball extremely well and the defense is keeping them in games. With the home crowd behind them, I think the Browns have an excellent chance to control the clock and play keepaway from the Bengals’ offense. This will likely be a low scoring game, and I think the Browns are unlikely to fall behind big in this game. Call it a gut feeling, but I think the Browns will control the running game and will figure out a way to win this game. – Texans over Raiders: This is certainly an intriguing game from the standpoint that the Raiders tend to show up at home, even if their fans don’t (another blackout is likely). Houston blew a big opportunity to make a statement when they lost to the in state rival Cowboys at home last week, but at 2-1 they still find themselves in a nice position in the AFC South. The Raiders let a win slip away in Arizona last week with a missed field goal, so both teams come in looking to rebound. I think the Texans have playoff talent, and in spite of last week their two wins were impressive. The Raiders have a good running game with Darren McFadden, but the quarterback play with Jason Campbell still is woefully inconsistent. I think Houston rebounds and wins this game fairly easily. – Colts over Jaguars: This is interesting only in that the Colts sometimes don’t play well in Jacksonville. Last year the Jaguars dropped 31 points on the Colts in their Florida meeting, but Indy managed to win anyway. I do think Jacksonville will be able to run the ball with Maurice Jones-Drew, who ran much better last week than he did in the first two games. The difference is going to be that their lack of a passing game will prevent them from keeping up with Peyton Manning and company this time. The Colts’ defense has played extremely well the last two games and I think they will play well again. Offensively, the Colts didn’t run the ball well last week, but they sure passed the ball effectively when they needed to. I think while it’s possible the Colts may not light the scoreboard up for 30 points in this game, I do think they’re going to score more than Jacksonville. – Titans over Broncos: This really pains me to think that Denver is likely to be 1-3, but I don’t like the way things are looking for my Broncos right now. Knowshon Moreno is out again due to his hamstring injury, and that means Laurence Maroney and Correll Buckhalter are going to have to carry the load. This is not a good prospect against a Titans defense that has been extremely effective in stopping the run. On the flipside, Tennessee has Chris Johnson, and while the Broncos have yet to allow a 100-yard rusher this year, Johnson is almost a given to hit that mark against any defense. I do think the Broncos passing game has a chance to be effective, but as we saw last week, that doesn’t matter if they can’t run the ball with any effectiveness. In any case the Titans defense has played very well, and I think that will continue for Jeff Fisher’s crew at home. – Chargers over Cardinals: This pick has lot more to do with the ineptitude of the Cardinals than it does the Chargers. Arizona won last week, but they were very lucky to do so. Derek Anderson is still mediocre at the quarterback position, and the defense has been very shaky. The Chargers looked awful on special teams last week in their loss to Seattle, and their offense hasn’t looked much better. Ryan Mathews returns this week so that will help the running game, and the Chargers usually play very well at home. I think they will get well against a mediocre opponent this week, but Philip Rivers and company need to show a lot more consistency to play with the rest of the AFC’s elite. – Eagles over Redskins: In the first three games, the top quarterback in the league has not been Brady, Manning or Brees. It’s been Michael Vick. Vick accounted for four touchdowns last week against the Jaguars, and if he keeps up this play you’re talking about a potential league MVP candidate. His play is overshadowing Donovan McNabb’s return to the city of brotherly love, so that should tell you how well Vick is playing. The Eagles offense looks like it can now score 30 points at any time, and if the defense duplicates last week’s effort they have a legitimate contender. The Redskins got stunned last week in St. Louis, and it now it appears that the week one win over Dallas may be a fluke. The Washington defense has been awful the last two games, and the running game has been so-so as well. The Eagles will win this one, and frankly this may not be close. – Packers over Lions: Green Bay will be hopping mad after the Bears stole one on Monday night at Soldier Field. The Packers committed 18 penalties, yet still had the game in their grasp. They cost themselves two interceptions with penalties alone. The Lions haven’t won a road game in nearly three years, and that’s not about to change at Lambeau Field. Jahvid Best is the real deal, but the Lions don’t have much else going for them at the moment. The Packers defense is among the best in the league and the offense can score points at will with Aaron Rodgers at the controls. This is my eliminator selection this week, and I think the Packers roll. – Falcons over 49ers: Atlanta is flying high after their win in New Orleans, while the 49ers have to rank as the league’s biggest disappointment after an 0-3 start and an embarrassing defeat in Kansas City last week. This should be a relatively easy win for the Falcons in the Georgia Dome, but I think this could actually be a close game. If the 49ers have any pride whatsoever, they need to come out with a great effort and they need to do it now. I think the 49ers defense will pose an interesting matchup for the Falcons’ offense, particularly if Michael Turner has a hard time getting going. I also think Frank Gore could be in line for a big day. In the end, I like Matt Ryan and Roddy White to hook up for one big play, and I think that will be the difference, but this will be close. – Saints over Panthers: The defending champs are back at home after their loss last week, and perhaps the biggest drama for New Orleans is that Drew Brees has been practicing with a brace on his knee this week. He says he is fine but it will be interesting to see if that is actually true on game day. The Saints are already without Reggie Bush and the feeling of coming off a loss is rare for them. Fortunately for them, the Panthers appear to be in for another long day with Jimmy Clausen’s first start on the road. Their only chance is to run with DeAngelo Williams and Jonathan Stewart, but the Saints defense will stack the line to stop it. I think the Saints rebound for what should be a fairly easy win at home. – Seahawks over Rams: Both teams are coming off wins last week, but is pretty shocking in itself being that both teams were expected to be awful in preseason. The X-factor here is that Steven Jackson left last week’s game with a groin injury, but he says it is just a tweak. He’s listed as day-to-day so it unknown if he will play in this game. Even if he plays, this is they type of injury that can linger and make Jackson less effective than usual. Sam Bradford has been playing well, but a lack of a running game would certainly be a detriment to the rookie quarterback. The Seahawks are 2-1 with surprising defense in their wins and great special teams play. Call it a hunch but I think they will steal this one on the road. – Giants over Bears: Chicago is 3-0, but I think they are lucky to be in that position due to the horrible call on what would have been Calvin Johnson’s winning TD catch in week one and the 18 penalties the Packers committed on Monday night. The Giants have looked horrible in their last two games particularly on defense, but I have a feeling the home crowd on Sunday night will pump them up. Jay Cutler should have thrown multiple picks last week, but two were wiped out by penalty and another two were dropped by Packers’ defenders. I think Cutler will not be so lucky this time on the road. I also think Ahmad Bradshaw will run well and that will help the Giants. As long as Eli Manning gets out of his funk and doesn’t throw multiple picks himself, I think the Giants will win this physical contest at home. – Dolphins over Patriots: Miami let one slip away at home in a division game and now must turn around and play another home division game. Once again the Dolphins will have the home crowd in a night game, so the atmosphere should help them. Brandon Marshall has really helped the passing game, but Miami will need to run a lot better than they did last week. That also seems to be the theme for the Patriots, who are battling injuries at running back and will likely start BenJarvus Green-Ellis, who did play well last week against Buffalo. New England struggled at home against a team they should have blown out, while Miami knows a win can help them keep pace in what should be an amazing division race. Tom Brady usually comes to play in big games like this, but I don’t think Miami will lose two division home games in a row.